Kracht nett vor sich hin. Bemerkenswert ist der etwas gospelige Schluss. Hayley Williams lässt hier die Puppen tanzen. Nicht übel, und ungemein catchy. Ich dachte, sie wäre selbst die Puppe, die tanzt.<br><br>Angeblich ja die zweiterotischste Frau im Rockbusiness. Wer immer da auch gefragt wurde. The best song of the 'Paramore' album, I think it could be a big hit if handled correctly, you gotta love a gospel choir! Awesome track, hopefully will become a single. Don't like this. The music's good, but the lyrics are terrible. Un très accrocheur troisième single issu de l'album "Paramore". It's alright but nothing on Still Into You. It really just goes through the motions and is fairly forgettable. Fantastic, I really like it. I still find this weird for Paramore, It's alright though. Solid follow up single to 'Still Into You' (and of the best tracks from 'Paramore' (album)), but I feel that they've turned the Rock down a notch. Sounds suspiciously like "Every Little Step". I really like this somehow. Qualitativ solider Popsong fürs Radio, aber halt doch ziemlich uninteressant und gewöhnlich. So grade eben noch mit allen zugedrückten Augen dieser Welt eine 4.
durchschnittlicher Song, ist im Radio gut anhörbar, aber kaufen würd ichs nicht! <br>Ist auch um einiges schwächer als "Still Into You"
Klinkt op sommige momenten als een bekende plaat, maar ik kom maar niet op de titel. Ach, het is prima te behappen. Een voldoende. ▒ Goede, vermakelijke plaat uit begin april 2013 van het Amerikaanse trio "Hayley Williams, Jeremy Davis en Taylor York", alias "Paramore" !!! Alleen géén hit in de Nederlandse hitlijsten ☺!!! nou vooruit. Het is te goed voor 3 sterren, dus ik geef er één extra! Nice pop-rock track with a little soul in the verses. Better than 'Still Into You'. It's fun, I'll give them that. Je suis complétement conquis par ce nouveau single et par ce mélange de style qui est juste sublime. De plus la vidéo est incroyablement originale et marrante. Some of the backing music is good but the rest doesn't match. 3.2. I'm so glad they won a Grammy for this song. 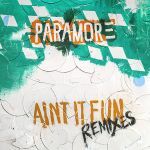 <br>It's good to listen to Paramore experimenting with Gospel music. This has held up very well actually. Stiekem nog best een leuk nummer, maar niet echt bijzonder.